[ Percy Nash, film director and dramatist. ] Large collection of material relating to Nash's musical play 'Clancarty', including correspondence with librettist Stanley West and composer H. Wolseley Charles, accounts, receipts. Mainly from London, and dating from between 1930 and 1934. The collection consists of around 140 items, and is in good condition, with light signs of age and wear. 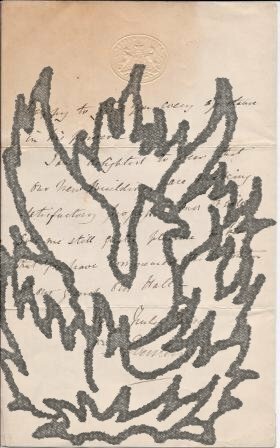 It includes two drafts of the play, correspondence with librettist and composer, agents, the syndicate backing the play, a disgruntled contributor, solicitors, theatre managers, and also includes returns, receipts, accounts and projections. [Printed pamphlet.] A Retrospect of the Education of the Deaf, on the occasion of the Clerc Centennial Commemoration. December 28th, 1885. With numerous illustrations engraed by Wm. R. Cullingworth. Philadelphia: Wm. R. Cullingworth, 517 Locust Street, 1886. 36pp., 12mo. In fair condition, on aged paper, with historic repairs to last leaf, and slight damage to spine from disbinding. Printed grey front wrap only. With stamp and label of the Educational Library, Science & Art Department, London. An attractive production, with numerous illustrations including several sign-language alphabets. Scarce: no copy on COPAC or OCLC WorldCat. 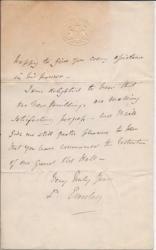 Two Autograph Letters Signed (both 'Eversley') from to 'Mr Yonge' [Julian Bargus Yonge of Otterbourne House? ], the second with reference to the British Museum. 20 March 1868 and May 24 1873, the first from 69 Eaton Place, London, and the second on the letterhead of the British Museum. Both 12mo, 2 pp. On bifoliums, the first with mourning border. Both texts clear and complete. Aged and lightly creased, with the first item bearing traces of being mounted in an album. Letter One: He hopes to be 'present at the next Sessions', and will be 'quite prepared after the County business is over, to attend the Committee of Subscribers to Sir William Heathcotes Portrait'.